Cic Saor - The significance of Paul Bew’s name on Anthony McIntyre’s employment contract lies in the simple fact that he signed it. However, some readers have made the fair point that Lord Bew witnessing this contracting does not mean that he was endorsing the contents of the contract and they are quite right. But – and this is a very important “but”. Unless Lord Bew was led blindfold to the table on which the contract lay or unless, as they say in Belfast parlance, he came up the river Lagan in a bubble, he was well aware that what he was witnessing (regardless of the actual requirements for hiring McIntyre etc.) 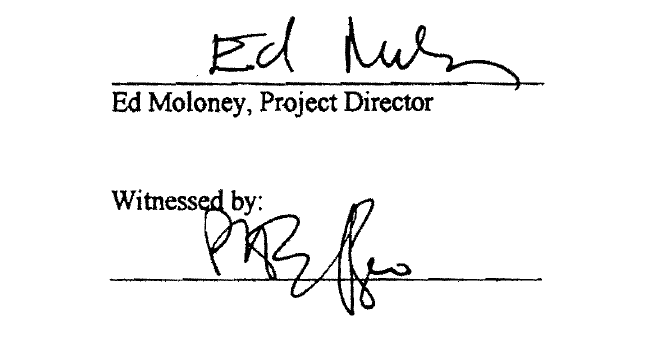 was an employment contract between Anthony McIntyre, Ed Moloney and Boston College. That same Boston College where he had proposed this same project not much more than a year or so before. Lord Paul Bew has never mentioned this contract – anywhere that I can see, but I will keep searching for a quote from him. He had a perfect opportunity to refer to the contract he witnessed in last week’s Sunday Independent where he describes his relationship with McIntyre at some length and could have easily said - and by the way I should mention that I witnessed his employment contract. This would not have implied that he approved the content of that contract, but one would have thought that it was an important detail for the UK’s senior guardian of ethics in public life to mention. Something he would want to make clear. What does Paul Bew actually say in the Sunday Independent article? Let us take Lord Bew’s words above to be true for a moment, despite all the evidence to the contrary. But then let us look anew at the February 2001 Boston College employment contract that he witnessed. Title: The significance of Paul Bew’s name on Anthony McIntyre’s employment contract lies in the simple fact that he signed it. Previous entry: « In February 2001, Lord Paul Bew signed an employment contract between Ed Moloney, Anthony McIntyre and Boston College - why has he hidden this fact?